Built in 1917 by the Methodist congregation,this wonderful wooden structure was shared by the Methodists and Lutherans for severalyears. Following World War I, the town of Barber declined, as did the MethodistCongregation. 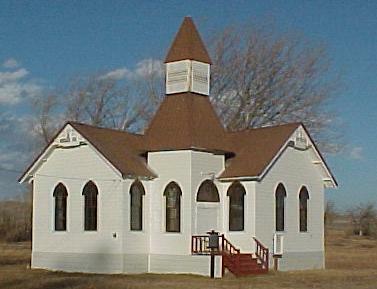 In 1977, the Lutherans purchased the building. It is the onlyremaining occupied building in historic Barber, and is listed in the National Register ofHistoric Places by the United States Department of the Interior in cooperation with theMontana Historical Society. The ghost town of Barber is located approximately seven mileswest of Ryegate on Highway 12.